High school baseball can provide many things for coaches, players, and fans. Thrilling moments, heartbreaking losses, and unbelievable performances are all on the field happenings that can capture the soul of the stadium. But what baseball does better than almost any other sport, is provide a canvas for healing. 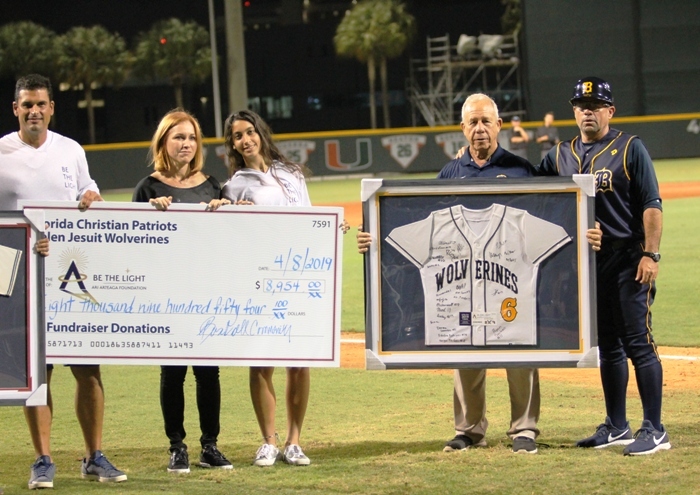 On Monday night, less than a year after the tragic car accident that claimed the life of Columbus student-athlete Ari Arteaga, the baseball community came together at Mark Light Stadium on the campus of the University of Miami, for the first annual Be The Light game, supporting the Ari Arteaga Foundation. And the healing that has been ongoing since last July, took another step forward. The game, almost an afterthought on this night, did pit two of the top teams in Miami, #7 Florida Christian and #10 Belen Jesuit. 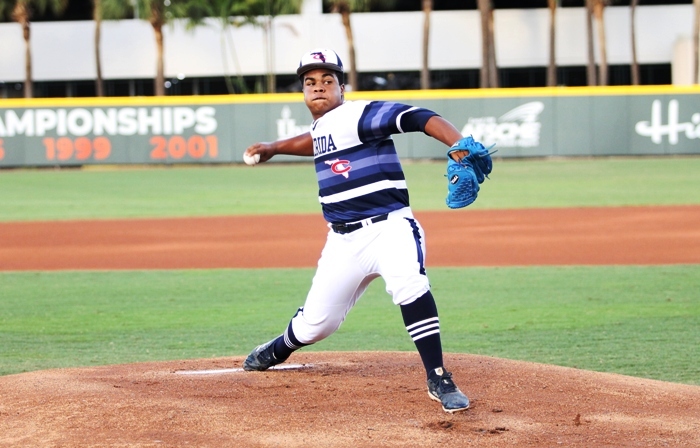 The Wolverines Alejandro Torres was nearly unhittable on the mound, going six strong innings of one hit ball on the way to a 6-0 Wolverines win. The performance of Torres was matched only Monday by the performance of the organizers of the event, Ysha Arteaga, Ari’s mother, and creator of the foundation, and Dorian Gonzalez, a close family friend who’s son plays for Belen and was best friend’s with Ari. Hundreds in attendance were treated to video montages, raffles between innings, and several on-field presentations. “We wanted to do something that would not only honor Ari’s passion for giving and helping others, but also would help in various areas of our community,” said Ysha Arteaga, when explaining why the foundation was created. Arteaga sat in on the HSBN Live! telecast of the game for an inning and explained all the things the foundation has done in its short existence. What started as a way to provide scholarships to student athletes in need here in Miami, has turned into something much larger. The foundation has helped pay rent for teens who turned 18 and were kicked out of foster homes, so they could finish their high school degrees. It also has provided assistance to many other children in need, and is moving along to start helping seniors in need. Be The Light is a slogan that Arteaga found while searching through Ari’s social media accounts after the tragedy. She explained how Ari’s friends explained to her that he had just weeks before the accident, posted Be The Light. Immediately the saying became the motto of the newly formed foundation. 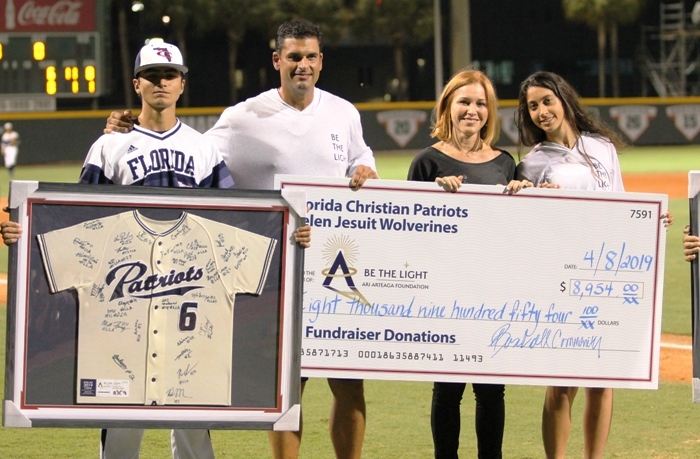 JD Arteaga, Ari’s father, and the pitching coach for the Miami Hurricanes, also has been involved in the foundation. He explained during his appearance in the broadcast booth Monday that the community that he grew up in and has been a central sports figure in for over two decades, has answered the call for the foundation. Overall, the game raised over $9,000 for the foundation. Belen Manager Jerry Albert echoed that sentiment. If anyone would like to contribute to the foundation, you can do so through the link below. On the field, outside of Torres’ performance, the Wolverines offense also stepped up. Belen’s hitters exploded for 14 hits and six of the nine batters in the lineup had two hits or more. One of those players was Gonzalez, who finished the day 2-for-4 with two runs. Armando Albert, Jorge DeGoti, Robert Curbelo, Esteban Rodriguez, and Joshua Salandy were the other Wolverines with multiple hits. Steven Diaz had the only hit for the Patriots, a first inning single. Florida Christian is back in action Wednesday against Coral Shores, before a weekend trip down to Key West for two games with the Conchs. 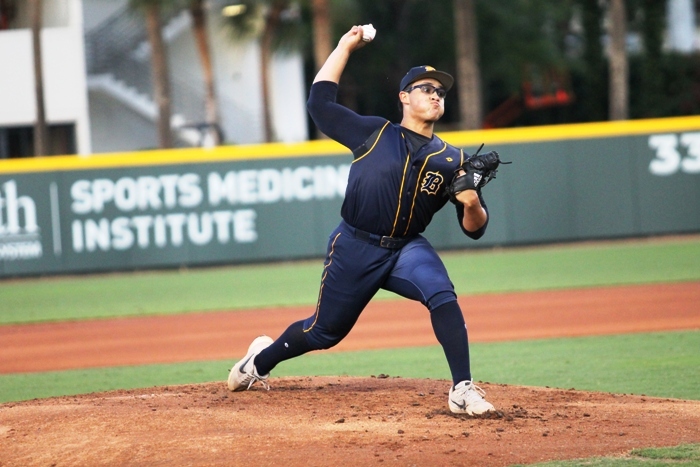 Belen will have another high profile game Wednesday, when they face Archbishop McCarthy at Marlins Park, before a Thursday district matchup with Sunset.